What is a Personalized Text Message? A personalized text message-also known as a tagged message-allows you to define a text message that can combine text that you type with tags that function as placeholders for information stored in the member record in the database or in another data source. 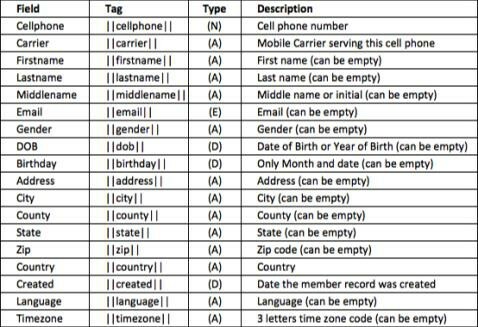 Textboom will automatically replace each tag with the particular data value for each member. You can use tags in any text message field. Note: The tags are only optional. There is no requirement whatsoever to use any tag when creating a text message. How to construct a message with tags? The text message that you want to send may be a combination of static text, data that is dynamically taken from the database or specialty values that are generated just before the message is sent. When you write a message, you enter the text that you want and insert tags precisely where you want to use personalized information. To separate tags from the text we use this notation: ||fieldname, parameter||. The items found between each “||” will be replaced by data that Textboom fetches the actual information and formatting it properly. The “||” will NOT be part of the message that is sent. The double “||” sign is made of two “|” (pipe) characters. Remember that the maximum length of the message to be sent is 160 characters. In checking the length, Textboom will also take into account the length of the tags. We highly recommend that you use tags with the max length parameter defined, so that you guarantee the final message will be fewer than 160 characters. For example, use ||firstname, 7|| instead of ||firstname|| to ensure that only the first 7 characters of the first name will be included. For some fields, you can also select the format for presenting the data. This is especially important for date fields. For example, use ||created, D1|| to display the date as mm-dd-yyyy (10 characters), or ||created, d3|| to display the date as yy-mm-dd (8 characters, with the year shown first). When crafting a message, you can use the data that the system stores in its database about members. The system has predefined fields that you can populate, as well as custom fields that you can define for your specific needs. City can be used as the tag ||city||, or if you define a custom field Tutor, the tag is ||tutor||. Now, since fields hold different type of information at different lengths, and text messages are limited in length, the system allows you to control the format (the presentation of the data) and restrict the length of the data. ||fieldname, max||, this will specify that up to first max characters of “fieldname” in the message. ||firstname,7|| will include the first 7 characters of the member’s first name. ||firstname,8|| = get the “first name” from db limited to first 8 characters. ||created,d1|| = get the “created” date from db and enter it in d1 format. ||Random, FormatLength|| – You can include a random tag to generate a unique code. The format of the random tag can define if this is a Numeric/Alphanumeric/Alpha type as well as combine lowercase and UPPERCASE characters. The length of the tag defines how many characters will be generated. You can generate a code separated by dash “-“ to create a multi- part code. Congrats ||firstname,7|| ||lastname,10|| you joined us on ||created||. Plz go to www.HelpHunger.com and enter code ||random,M3-3-3|| To finalize ur application. Congrats ||firstname,8|| for joining our Mobile VIP Club. Plz call 800-123-4567 and enter code ||random,N6|| To finalize ur application. ||Now[+/-n H/D/W/M/Y], [Timezone], [Format]|| – You can include a date tag that will generate a date based on date/time now. A date will be automatically generated by the system, based on Now (the current date & time). You can include a +/- delta (hours, days, weeks, months, years) from Now() and decide if the date should consider the recipient time zone (if available) or a specified time zone. The format of the Now tag defines the appearance of the date in the message and it takes the same formats like any other Date field that is stored in the database. Congrats ||firstname,7|| ||lastname,10|| you are the winner of our big prize. Plz arrive to our store on 123 main street until ||NOW+1W, CST, D1|| to claim ur prize. ||now+1W, EST|| to introduce you to the specials of the VIP club. Plz call 800-123-4567 if you need to reschedule. In the second example, the tag is using the default date format (d1), so it doesn’t need to be included. ||T2WCOUNTER, [X][n]|| – This is a specialty tag for Text 2 Win campaign where many members text a keyword and the system keeps count of how many texted in. Each message that was received is assigned a number based on the order in which it was received (like in a queue) and this number can be used as a tag in the response message. The optional parameter X of this tag allows you to select if the system should present the actual counter number or the remainder of diving the counter by X. This way the number the system will generate for this code will always be between 1 and X-1. The optional parameter n, can be replaced by any number between 1 and 9 to set how many digit will be used to show the counter value. E.g. ||t2wcounter,3|| will show 001. ||T2WCOUNTER, X2||. In this example, the tag will return the numbers 01 to 49. With tags, it is a little more complex to compose a text message without making mistakes. The preview window should assist you to ensure that the outcome represent the indented message. Textboom holds a “Preview Member” that has all member fields populated. This “Preview Member” is used to show you what a real message would look like when the tags are replaced with actual data stored in the database.